TREKSTOCK launches this year with an exclusive gig at Proud, Camden on May 13th. 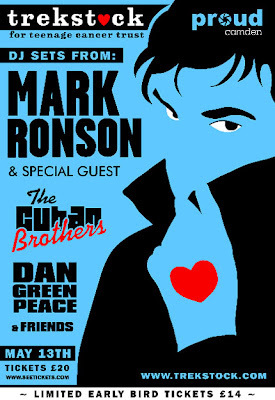 Mark RonsonA Special GuestDan GreenpeaceThe Cuban Brothers& Friends. Founded in 2006, Trekstock has raised thousands of pounds for Teenage Cancer Trust. Publicado por min it en 9:04:00 a. m.